When I look at nature, I often find a source of inspir-ation for an abstract painting. I often change the way I look at the world around me and start looking at details of mother earth's creations. I look at shapes and patterns which occur rather than the "big" picture. 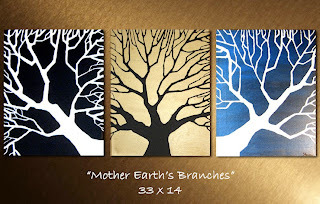 Using nature as a source of inspiration I have created "Mother Earth's Branches."